The lights are low, the music is turned up, wine is flowing, and the energy is buzzing in the air. It's a perfect evening and the perfect setting for...Italian food at MAMBO'S. With creative twists on classic recipes there is something for everyone in the family. It's Italian Nachos, Minestrone, Lasagne, Tiramisu, Chianti, Frank Sinatra, Great Fun, Wonderful Service and a whole lot more... Ciao Mambo's atmosphere works just as well for romantic couples as it does for a cozy table of family, friends and children too. At Mambo's, we serve up immigrant style Southern Italian cuisine in a happening family ambiance. Our pasta dishes with rich, savory sauces and fresh ingredients, thin crust pizzas baked to perfection, and unmatchable service will keep you coming back for more. If the atmosphere and friendly service don't seduce you, the pasta will. Bring your friends, family and appetite for fun, and we'll handle the rest. Ciao Mambo is located in downtown Billings. 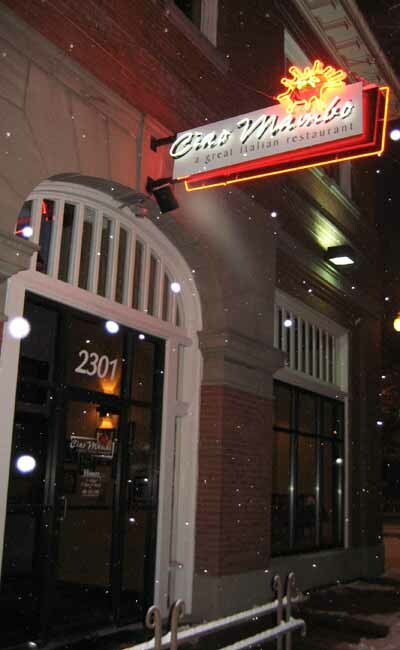 Corner of Montana Avenue and 23rd Street.Ciao Mambo is located in downtown Billings. Corner of Montana Avenue and 23rd Street.